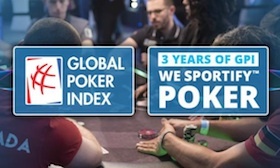 Saw this morning Alexandre Dreyfus tweeting that the Global Poker Index was marking its third anniversary today. Kind of interesting to think how much the GPI has managed over these three years to locate itself near the center of everything as far as tournament poker goes. The rankings get referenced a lot in poker media, most full-time tourney players are at least aware of them (if not genuinely motivated by them), and of course the various events and partnerships (such as with the WSOP) have increased the GPI’s profile even further. The use of the GPI’s formula to determine the WSOP Player of the Year this time around earned a lot of cynical response (including from your humble scribbler), but setting that aside, the general ranking system has at least worked to some extent as a kind of shorthand reference indicating players’ relative consistency when it comes to tournaments. Think about tournament poker as it was played 10 years ago, during the height of the “boom.” How were players’ performances judged against one another then? And, concomitantly, how were online sponsorships -- in abundance then -- awarded? It was a fairly scattershot process, almost entirely manipulated by television exposure. That’s not to say the GPI is the best way to measure what tournament players have done and thereby suggest what they might do in the future, but at least there’s a kind of method being followed that is more obviously meaningful and less random.